Should I use my bike lights in flashing mode? This is a popular question in the bicycling community, and the right answer depends on many factors. A study on snowplow safety found by Byron Ross on the Bicycles Stack Exchange site explains that flashing lights appear brighter to the human eye than a steady light at the same output level. Flashing lights grab attention faster, but it's also much harder to estimate the distance and speed of a flashing light than a steady one. Riding at night: High-intensity forward-facing lights should not be flashed alone at night, especially if they put out over 200 lumens. You run the risk of disorienting oncoming traffic (be it on 4 or 2 wheels), and make it difficult to estimate your position and speed. Having one flashing light and one steady light is a good compromise — you can grab drivers' attention but the steady light helps improve distance estimates. Avoid extreme strobe patterns though, and opt for a pulsing light (like on the Light and Motion Urban 700) or a subtler flash like Cygolite's Metro and Expilion series. Rear lights tend to be less bright, and are therefore more appropriate for flashing at night; however, the same principle of distance and speed estimates applies. If riding with just a single light, using it in a medium-speed pulse mode (like those available on the Cygolite Hotshot and the PDW Danger Zone) is a good compromise. Using two taillights is strongly suggested though, using one in flashing mode and the second in steady burn. If you're upgrading to a new light, consider one with a rechargeable battery to use in steady mode, and use your old light in flashing mode. How should I position my bike lights? Generally speaking, lights should be positioned as far apart as possible. The further two points of light are away from each other, the further away the eye can distinguish them. Separating lights vertically also ensures that you will be seen by people in low and tall vehicles alike. For headlights a good setup is to have a primary handlebar mounted headlight, and a secondary light on the helmet. Good helmet lights should have a narrow beam and not be too bright - you want to be able to light up a specific area where you're looking without blinding everyone around you. For taillights, a rack or seatpost mounted light in addition to a helmet light provides good coverage. More details on taillight placement are available on the recommended taillights page. What do lumens, candlepower, and lux mean? How are they measured? The three primary brightness units are Candela (luminous intensity), Lux (luminous flux per area, aka illuminance), and Lumens (luminous flux). Candela measures absolute brightness at a point. In other words, it measures the amount of brightness going in only one specific direction. This unit is sometimes used to define maximum brightness of a light. The value for candelas is the same regardless of distance from the light, but will be different depending on the angle from the light. Lumens measure total luminous flux, in other words the total output of a light source in all directions that it points. If you were to integrate the candelas measured in every direction around a light source, you would get lumens. Lumens are measured using an integrating sphere, a scientific instrument that uses a reflective sphere to normalize the light beam and measure its intensity. Lux is lumens per area. If you project a light onto a surface and add up the total amount of light hitting it and divide by the area of the surface, you get lux. The brightness in lux depends on the distance at which you measure it. Illuminance is inversely proportional to the square of the distance, so in order for lux to be a useful measurement you must know the distance at which it was measured. Lumens are the most commonly reported value for bike light brightness. Many manufacturers use an "estimated" or "specified" brightness based on the LED's specifications at a certain power level, but the actual brightness will depend on the circuitry used, how efficient the light's optics are, the temperature the light operates at, and the quality of the LED. Many lights' claimed lumens are 10-40% higher than the actual brightness. The ANSI FL1 Standard specifies a specific, repeatable method for measuring the brightness of a flashlight or bike light. Lights certified by the manufacturer with the FL1 Standard are marked with an "FL1" logo on the Bike Light Database. Why do some bike lights cost so much when I can get a 1200 lumen light on Amazon for $15? As explained above, many manufacturers overstate their lumen claims - especially no-name overseas manufacturers selling exclusively through online stores. While these lights rarely live up to their claims, they are always more than bright enough for most users. The primary disadvantage is in the build quality: these lights are typically designed to be as cheap as possible, and are not built with cycling convenience in mind. Battery quality in particular is often overlooked, and the battery packs are rarely waterproof and often the capacity drops significantly after minimal use. On the generic "Cree T6 LED light" available on Amazon that we reviewed, the optics focused the beam into a small, over-bright circle of light. Even with an extra diffusing lens, the light still only illuminates a small area. That area is as bright as day, but it's too small to be useful. Additionally, the external battery pack is inconvenient, and the lights often don't have a quick-release in a useful position for removing the light when you leave your bike outside somewhere. Finally, with no warranty or even a real company to support the product, you're on your own if the light dies. These types of no-name cheap bike lights are great for people looking to get a lot of light at a low cost, but they are not a replacement for the carefully designed optics, superior mounting hardware, and light-weight integrated systems offered from real bike light companies. Most USB-rechargeable bike headlights these days use a single 18650 battery internally, which is recharged through a USB port on the light. In most lights the battery is not user accessible. A few lights have a removable battery but contain the 18650 cell in a proprietary casing. For example, the image above shows the proprietary battery packs for the Cateye Volt 700, Cygolite Expilion, and Serfas TSL, along with a standard 18650 protected cell. If you want extras of these proprietary packaged batteries, you have to pay $30-50 for a single battery pack which can't be charged in a standard charger or used in any other lights. With a few lights like the Fenix BC30, BC21R, and the Lezyne Super Drive XL), the batteries are directly accessible. This means you can get as many extra batteries as you want, swap them out any time, and charge them with any standard charger. For people doing really long rides, or who just don't want to worry about running out of charge on a ride, this setup is a great choice. Bike taillights more commonly use lithium polymer battery packs (similar to those in cellphones) because they can be manufactured as smaller, flatter packs. Taillights usually don't draw as much power as headlights do, do these lower-capacity packs are possible. I have yet to see any bike taillight which takes a user-replaceable 18650 battery. If you see one, please let me know! You always have to be careful when handling 18650 batteries. They have a very high energy density, so if they're overcharged, overdischarged, or shorted they can cause a fire. Some 18650 batteries are "bare cells". 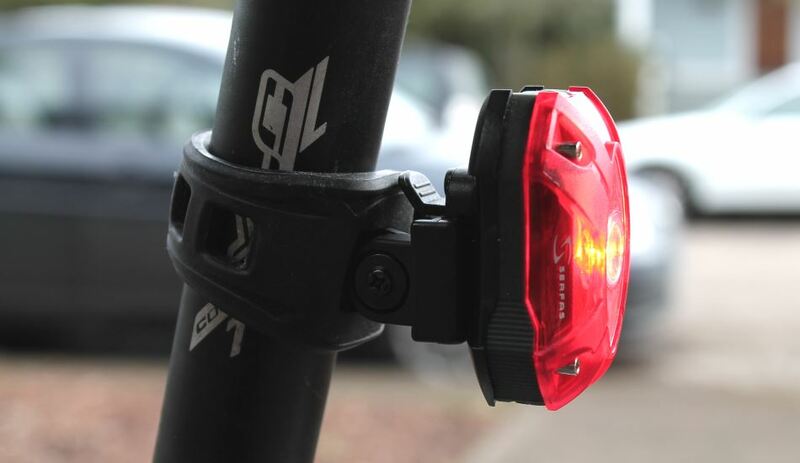 In certain lights they can give higher performance (although it shouldn't make a difference for the Fenix and Lezyne lights mentioned), but are more likely to become a hazard if not taken care of. Protected cells have a small circuit built into the top of the battery which prevents overdischarge, overcharging, and short circuits. The protection circuit adds a couple millimeters of length, so they won't fit in a few lights, but they do fit in every 18650 bike light I've tested. In general I would recommend protected cells – they cost a tiny bit more, but it's worth the extra peace of mind in my opinion. Many low-quality super-cheap generic Chinese lights use 18650 batteries. Some are fine, but many of these batteries are extremely dangerous and most are low-quality. It's very common for the battery's actual capacity to be much less than its stated capacity. For example, 18650 batteries sold under the "UltraFire" brand often claim 4000+ mAh of capacity. In reality, the highest capacity 18650 available as of spring 2016 is 3600 mAh, and independent testing has found the UltraFire counterfeits to only be about 900 mAh cells in reality. These cheap cells are also less likely to have a protection circuit, and the construction quality is usually very poor. For safety reasons, most lighting enthusiasts strongly recommend only purchasing and using 18650 cells by reputable manufacturers and sold by authorized dealers. The cheapest high-quality and high-capacity protected 18650 batteries available are the KeepPower 3400 mAh, sold by Illumn.com. At $11 each, they're about half the price of most other 3400 mAh protected cells, and use the same Panasonic NCR18650B cell inside as name brands like Nitecore and Olight. These are the top choice of many flashlight addicts, and it's hard to find a better bargain. AA(A) batteries have a much lower energy density than lithium batteries, so I don't recommend buying a new light which takes AA(A) batteries. If you already have a light which takes AA(A) batteries and you like it though, your best bet are Panasonic Eneloops. These have the best performance and capacity of rechargeable AA and AAA batteries, and are widely recommended. These batteries are frequently updated with better capacities, so make sure to get the most recent version. As of spring 2016, the Pro series batteries have up to 2550 mAh in AA and 2000 mAh in AAA. Note that these are 1.2 V batteries, so the energy capacity is much lower than 3.7 V 18650 batteries even if the mAh are higher in some cases. You can buy Eneloop batteries on Amazon in various package sizes and combinations. I have an aero seatpost; what lights will work with it? Serfas Thunderbolt: With silicone mounting straps and a slim profile, this light is easy to mount on almost any seatpost shape. However, if your seatpost is at a significant angle, much of the light may be directed towards the ground. The width of the plastic nubs that the straps attach to is just right to clip into the saddle rails of most seats though, which is how I would mount this light on a road bike with an aero post. Serfas TL-60 or TL-80: Both of Serfas' high-intensity taillights feature a plastic slide-in mount that is attached to the seatpost with a silicone strap. The shape of the rigid plastic clip the light slides into isn't quite ideally suited to an aero post, but users on other sites have reported success using a small piece of foam to pad it. The silicone strap easily conforms to the shape of the post, allowing the light to be securely attached. Light and Motion Vis 180: The Vis 180's sturdy mount is a favorite, and its rubber strap will work with nearly any post shape. The mount angle is adjustable as well, so this mount works well regardless of the angle of the post. As of Fall 2015, L&M has started selling a specific aero mount adapter for use with this light. You can buy it directly from L&M, or on Amazon for $10. Planet Bike taillights: Planet Bike just released a new aero post mount that is compatible with all of their taillights, as well as with any Portland Design Works taillights. The mount is available on the Planet Bike website for $6 with free shipping, but is not included by default with any of their lights. What about dynamo generator powered lights? Dynamos are an excellent choice for commuting, touring, utility cycling, and even some kinds of mountain biking. A hub dynamo is a generator built into the hub of the front wheel. The energy from this generator powers lights that can run any time the bike is moving. High-end generator hubs only have about 2 W of drag when the lights are not running, and about 8 W when the lights are on. Entry-level hubs have about 8 W of drag when lights are on and about 7 W when the lights are off. For comparison, a human typically puts out around 200-300 W when riding a bike. Installing a dynamo is a non-trivial task, as it requires completely rebuilding the wheel. This can be rather daunting, so it is common to hire a local bike shop to do the conversion and installation. Dynamo lights tend not to be transferable between bikes. Most dynamo lights are semi-permanently attached to the bike. Though typically attached in such a way as to make theft difficult, there's generally no option to bring the lights with you if locking up in a high-crime area. The brightest dynamo lights cannot compete with the brightest battery-powered lights in terms of max output; however, they clearly can compete in terms of total output over time, because batteries are not a concern. The Sanyo H27 hub is a good entry-level hub, and retails for around $50. Remember that you'll need to get it installed in a wheel. I would recommend purchasing this through your LBS, not an online shop, as it's the best way to guarantee you get the right components for your bike. There are different versions for different spoke counts. The Busch and Muller Lumotec Eyc T Senso Plus light is a nice entry-level dynamo headlight, retailing for $70-80. It automatically adjusts to your speed and the outdoor light level to create the optimal beam. During the day it has a daytime running light mode which increases visibility to other road users, and at night it'll automatically vary the beam distance with your speed so that at high speeds the beam distance reaches further. Alternatively, for urban commuters in particular, the Lumotec IQ Premium Fly RT Senso Plus runs about $90-100, and is very similar to the Eyc. The Fly RT has a much better daytime running light, comprised of 12 LEDs that create a large illuminated surface area. The light similarly adjusts the brightness of the running lights and the headlamp depending on how dark it is outside. For a taillight, the B&M Toplight Line Plus is fairly standard, retailing for $30-40. It's compatible with both of the aforementioned headlights. It uses an internal lens to create a wide bar of light, and has a large integrated reflector. The Brake version analyzes the voltage from the dynamo to determine when you're slowing down, and flashes as you brake. It costs $50. Ask questions about bike lights and anything else bicycle related on the Stack Exchange Bicycles site, a free Q&A network for bike enthusiasts.